Personal transportation, you say? These electric skateboards will definitely take you for miles without getting behind a four-wheeled car. You can use it in going to school, work, shopping trips, and anywhere you want to go around the city. They are even faster, easier, healthier and a more fun leisure activity! This electric skateboard has impressive results and intuitive controls. It offers more-nuanced handling and a faster top speed than other boards. It uses a belt-drive motor to propel its back wheels that offer more power, tighter handling, and a smoother riding experience. Its motor provides 2,000 watts of power, enough to reach 22 mph and to climb hills with a 25 percent grade. The battery and motor components were split into two hubs placed just behind the trucks on either side of the board which leaves the middle of the board free of any stiff and plastic pieces. Compared to other models, it has bamboo deck flexes much like that of a regular longboard. It also features 80 mm wheels from Orangatang. One thing nice about this skateboard is the remote control which is user-friendly, with two buttons, a roll wheel, and a few LEDs. One button turns the remote on and off, and you can hold it down or press it multiple times to change settings. The other button is a kill switch, which you must hold down to activate the board. The roll wheel controls acceleration and deceleration and is big enough to allow for nuanced control over your speed. It has four riding modes (Beginner, Eco, Expert, and Pro). The Beginner or Eco mode can go up only smaller hills, and your top speed is limited to either 11 mph or 16 mph. Expert mode bumps the top speed up to 20 mph and lets you take on steeper hills, and Pro mode removes all restrictions, pushing the board as hard as it can go. Its battery charges quickly and offers a six-month warranty. It uses a regenerative braking feature that recharges the battery using the energy it creates while braking but the battery begins to overcharge if you’re going down a steep hill and braking hard. The board shuts itself off to prevent overheating which is good but it also leaves you rolling down a big hill without any brakes, which is less good. Unfortunately, it costs a jaw-dropping $1,500, with upgrade packages costing several hundred more. 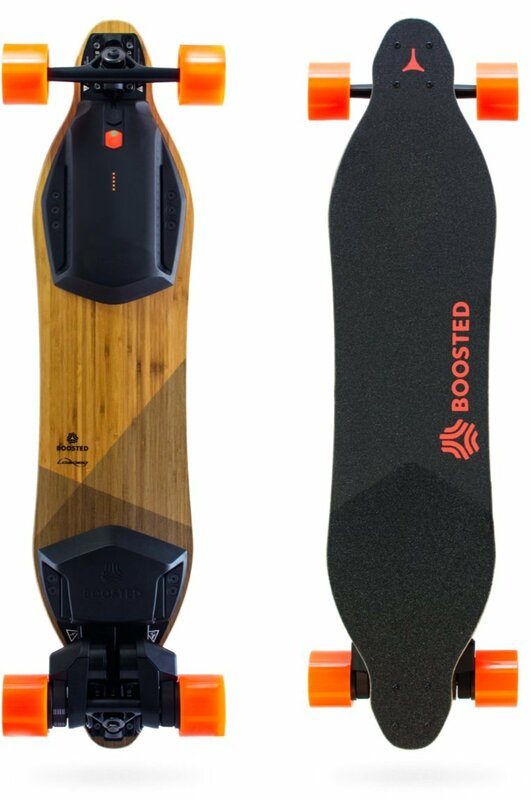 This electric skateboard has a very affordable price yet it is not the most powerful board around nor does it have the longest range or fastest top speed. 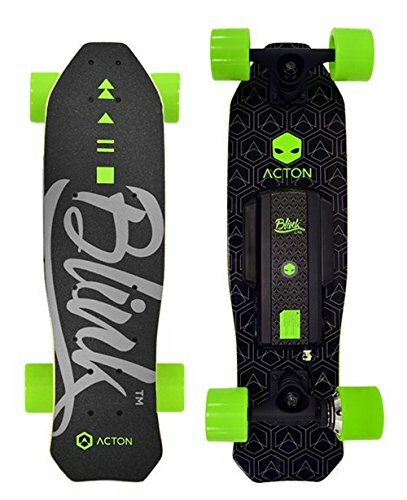 It is an ideal entry-level electric board for people who just want to have fun with it and not pushing around. Its shape is a tad smaller and skinnier, and the kicktail was more pronounced which is a good side to it. It is only 30 inches in length and weighs just 7.7 pounds, making it a great option for fitting inside a locker or underneath a desk. The downsides to this skateboard are that not impressive with the 5-mile range and a 10 mph top speed, handles hills at an 8 percent grade and has 70 mm wheels and the single in-wheel motor puts out only 250 watts of power. And it can carry only 180-pound of weight. Also, its design looks funky which is disappointing. However, it is a great choice for parents buying gifts for their kids, students wanting to zip around campus, and core skaters! 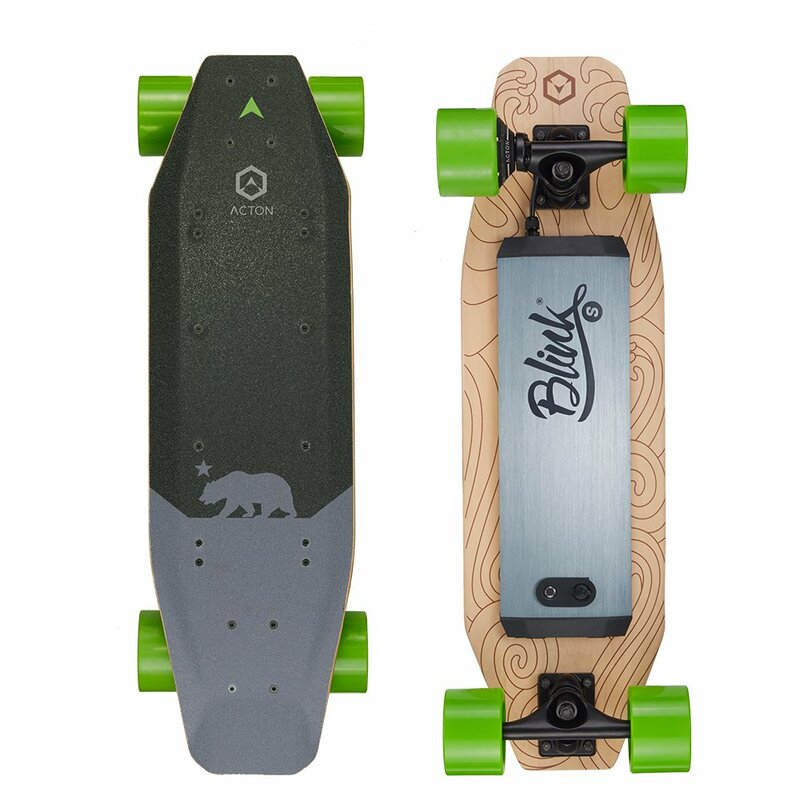 This electric skateboard is the most powerful and has a faster top speed compared to other models that made it to the top of our list for the best electric skateboards you can buy. Its single in-wheel hub motor puts out 600 watts of power, which equates to a 15 mph top speed and the ability to climb hills at a 15 percent grade. It can safely transport riders up to 220 pounds in weight. It can travel about 7 miles on a full charge. It takes about an hour to fully charge from empty, and the charger has a convenient LED that indicates when the battery is full. It rides smoothly over most surfaces with its 83 mm wheels and 27.5-inch deck. It features a kicktail for navigating over bumps and cracks and through congested areas. It also features flared sides which are supposed to help with sliding and downhill skating. You will also get an intuitive remote control. The front has just a large slider for controlling acceleration and braking, and you get two switches on the side: one to turn the remote on, and one for switching between the forward and reverse modes. Unfortunately, the board loses connection to the remote when either the remote’s battery or the board’s battery was running low but reconnects within a few seconds.